When I was told that I had the opportunity to attend a monster truck show for work, I was… a bit hesitant, to say the least. Having never experienced a monster truck show before, I didn’t really know what to expect, and my expectations weren’t exactly the greatest. Now, after attending—and surviving—the East Coast Monster Jam show featuring Amsoil Vehicles in Dayton, Ohio, I honestly can’t wait to go back. 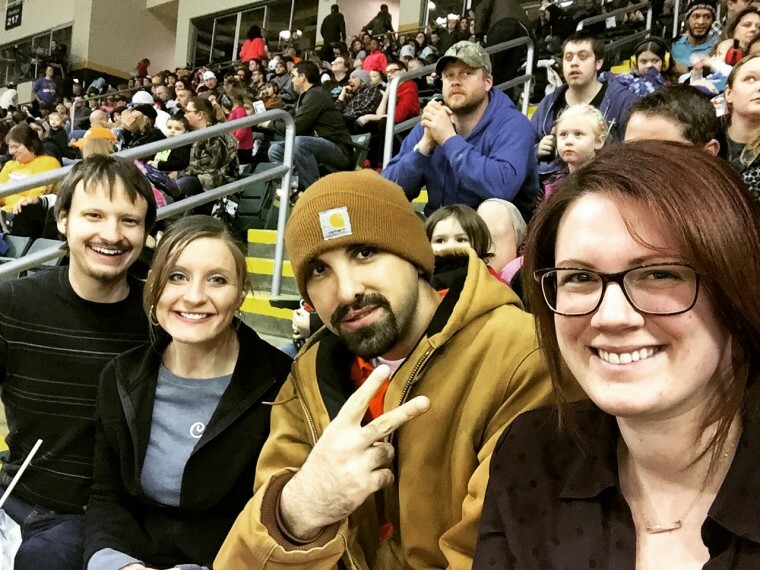 If you’re a Monster Jam first-timer like I was, here are some important things you should expect at your first monster truck show. Because the monster trucks are really, really loud. They don’t particularly warn you about that bit. Bring ear plugs with you for the show and, if you’re sensitive to noise, safety headsets, too. You won’t be sorry. I expected the loud noises. I expected the overwhelming smell of gasoline fumes. What I definitely did not expect was the effect that the gasoline fumes and dirt will have on my eyes. Turns out, gas + dirt = watering eyes. Times about a million. If you have sensitive eyes, I suggest bringing along some eye drops, especially if you wear contacts. I was wearing my glasses to the Monster Jam show and, while I had a really great time, the entire time it felt like I was weeping. Eye drops would have been a happy relief. I’m not sure why, but going into this show I thought there was going to be a lot more destruction than there was. Rather than what you think of as a demolition derby, the destruction was at a very bare minimum. Yes, there were two cars that the trucks could roll over during the freestyle segment, but they were only used a couple times during the show. So don’t expect to see the carcasses of crushed cars scattered about the arena—that’s just not how Monster Jam works. There aren’t very many events where you can meet the actual participants so easily. At the end of every Monster Jam show—and usually during the day on Saturday shows—you have the opportunity to meet the men and women who get behind the wheel of these gigantic machines. It’s really a wonderful opportunity for people of all ages. 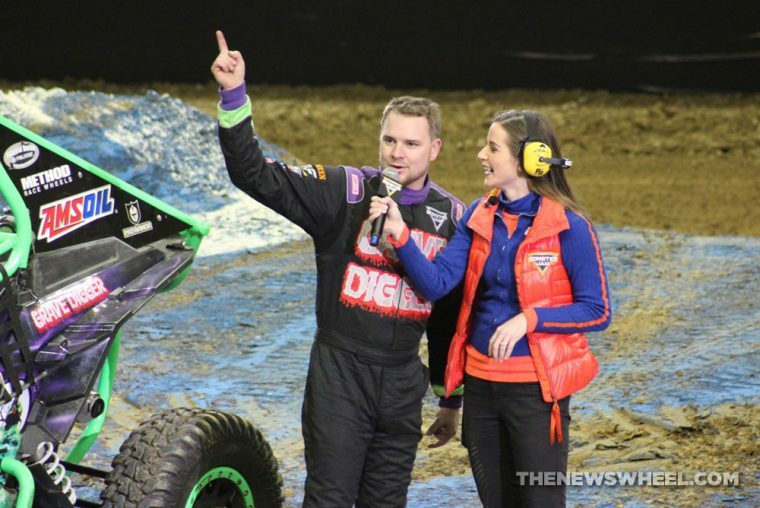 The drivers of Monster Jam are some really great people, which I learned during an exclusive interview my colleagues and I had with Bari Musawwir. These men and women enjoy interacting with their fans so much that you can frequently see them re-posting things from fans’ Instagram and Twitter accounts. Despite the fact that the show I attended was indoors—like all Monster Jam shows are—it was absolutely freezing. When I first sat down, I took off my jacket, thinking the arena would warm up as the show progressed. It definitely didn’t get warm. By the second event, I put my heavy duty winter coat back on because my hands were basically numb. It’s cold for a very good reason, though. The Monster Jam officials don’t want the trucks to overheat the air, so they keep it near freezing. So, make sure you’re prepared for some cold temperatures when you attend a Monster Jam event. 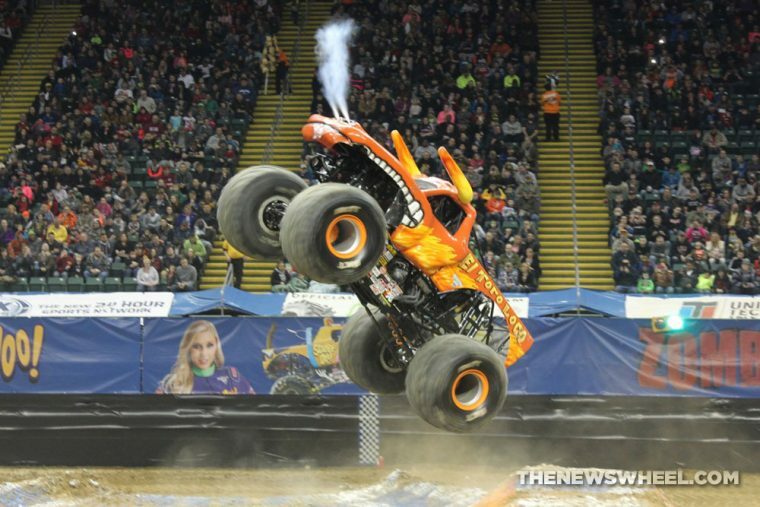 For a diverse show, Monster Jam offers seven total events with three different vehicles. The vehicles include the truck, speedster, and ATV. At the beginning of the event, there is truck racing, speedster racing, a speedster obstacle course, and a group ATV race. While the entire event is entertaining, when the big trucks come to play, you get into the really good stuff. There are the wheelies, doughnuts, and freestyle competitions, which are all huge hits with the audience. The freestyle event is one of the biggest contributors to the overall driver’s score, and the trucks truly strut their stuff during it. 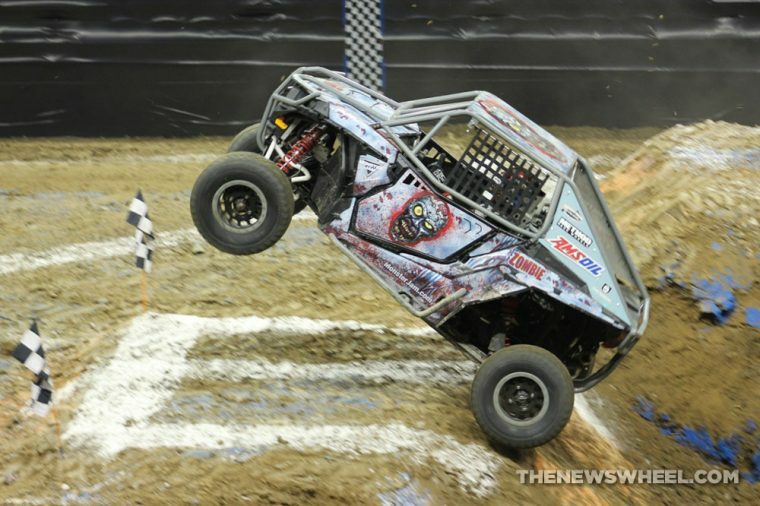 Monster Jam’s list of events offers some pretty awesome opportunities for pictures. In fact, we caught a couple really terrific shots throughout the show. When you attend a Monster Jam event, though, you’re not allowed to bring a fancy shmancy camera. Instead, you can only bring basic point-and-clicks or cell phones. The only reason why we were able to get into the show with our long lens camera was because we were press. So, be prepared to leave your nice camera behind. 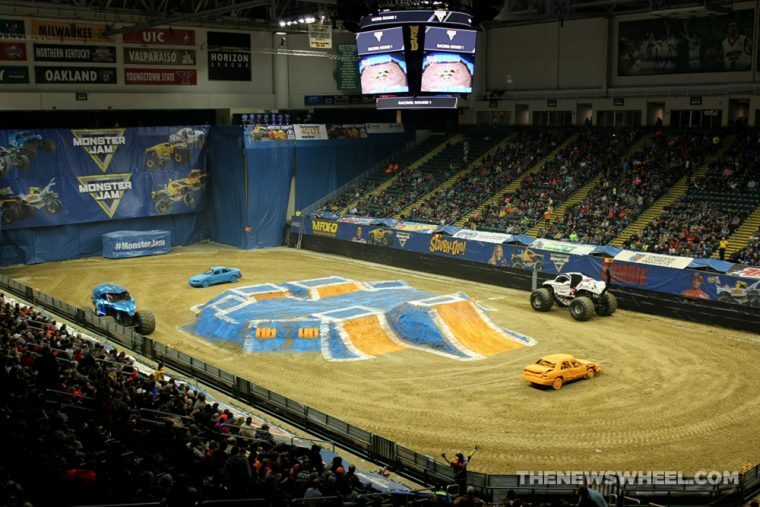 Before you enter the arena, push aside any preconceived notion you have of Monster Jam and monster trucks in general. The event isn’t going to be what you think it is. Many people believe that monster truck shows cater to an audience that are often described—for lack of a better word—as rednecks. And, while there definitely is an abundance of camo clothing and American flags, there is also a lot of diversity. The event isn’t just looking to appeal to one specific type of person; instead, it promotes itself in a way that could appeal to every class, gender, and race. Bari Musawwir, the Zombie driver, even mentioned the Monster Jam franchise’s ability to relate to everyone. It truly is an eye-opening experience and one that I definitely didn’t expect to enjoy—but one that I had a blast at.